I have been making these roses for quite some time. I now offer them on Etsy as a single, 3-pack, 6-pack and as a dozen. These roses measure about 12" long, and 3/4" diameter rose-bud. They look great on a shelf and never wilt or die! 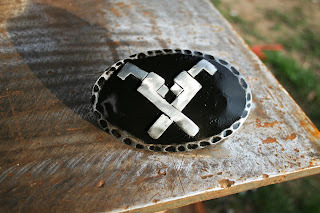 Fun buckle to make. Hand cut wrenches, welded on from the back. Hammered edge. Black paint. Nice and clean, I am happy with the finished product.